Today may be the “pick of the week”… sunny skies almost all day, reasonably calm water, and temperatures in the low 80s. What better way to spend it than visiting three beaches? 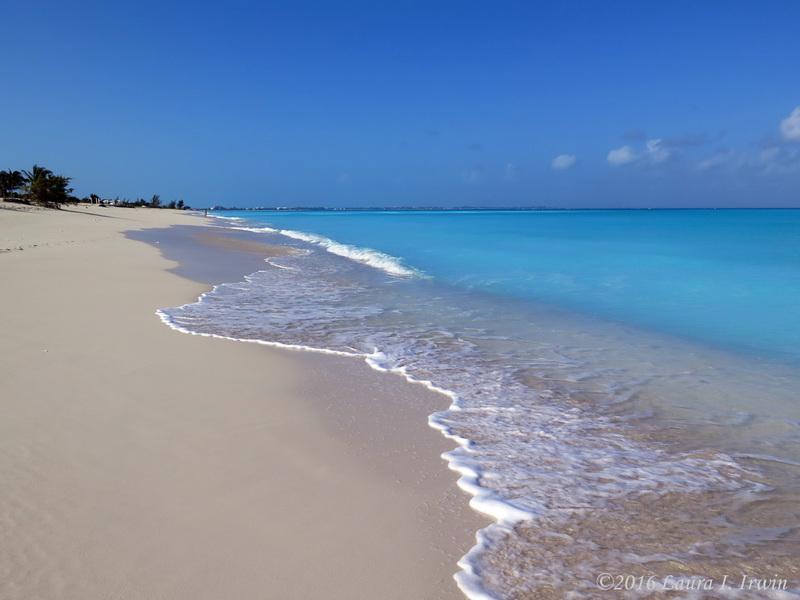 I started the day with a long walk on Grace Bay Beach this morning. The sky was cloudy, but there were some breaks. I set off toward the main hub area of Grace Bay. 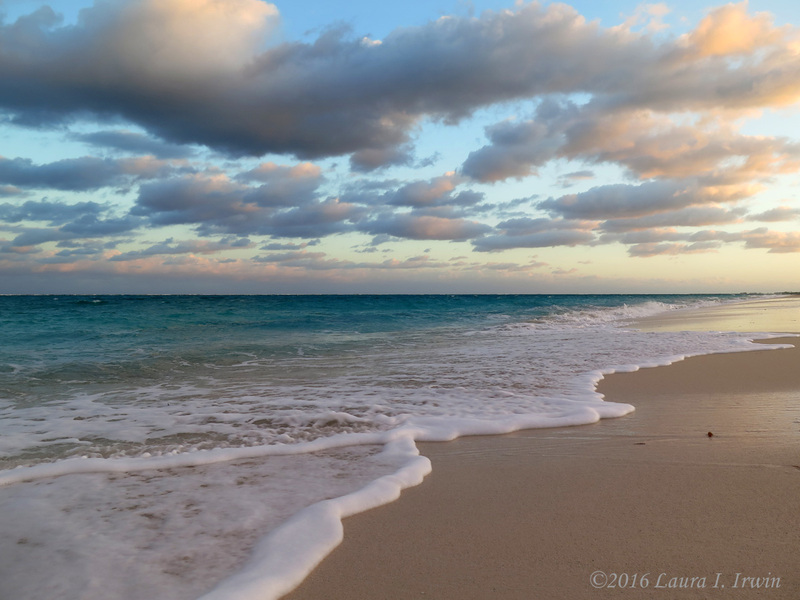 The Sands is ideally situated with vacant lots on either side, so the beach feels like you have room to spread out. Not so going in either direction. The resorts sit almost on top of one another and were it not for the different colors/styles, it would be hard to tell where one resort’s beach area ends and the next’s begins. After my beach walk, it was time to get ready for a day of fun in the sun. I ate breakfast at the resort restaurant, Hemingway’s. 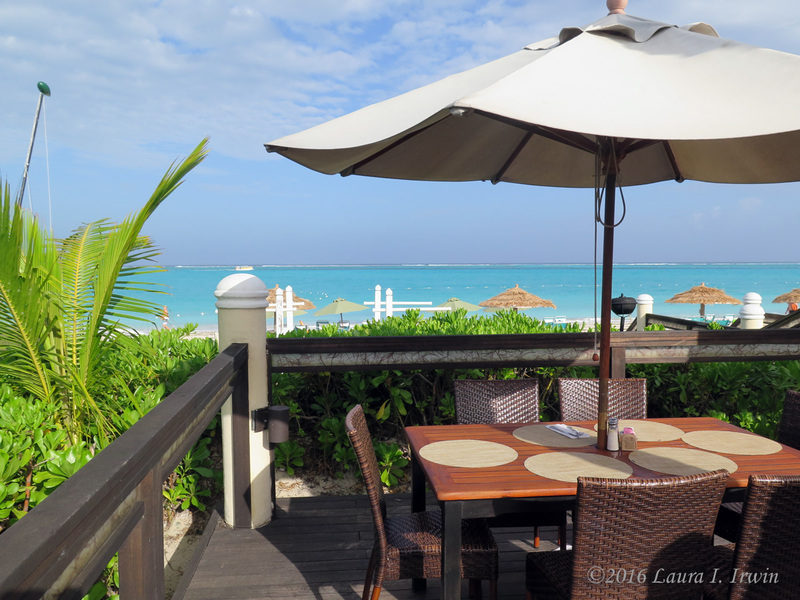 The restaurant is situated directly on the water with deck seats overlooking the beach and Grace Bay. By then, the sun had come out and I enjoyed a leisurely breakfast of eggs Benedict while I watched the waves roll in. After breakfast I spent a couple of hours on the beach reading and swimming. The water temperature is warm, but not exactly bath water. Since I’m not a salt water person anyway, a few minutes at a time was plenty for me. Leaving the beach, I spent some time by the pool before setting off for the afternoon. 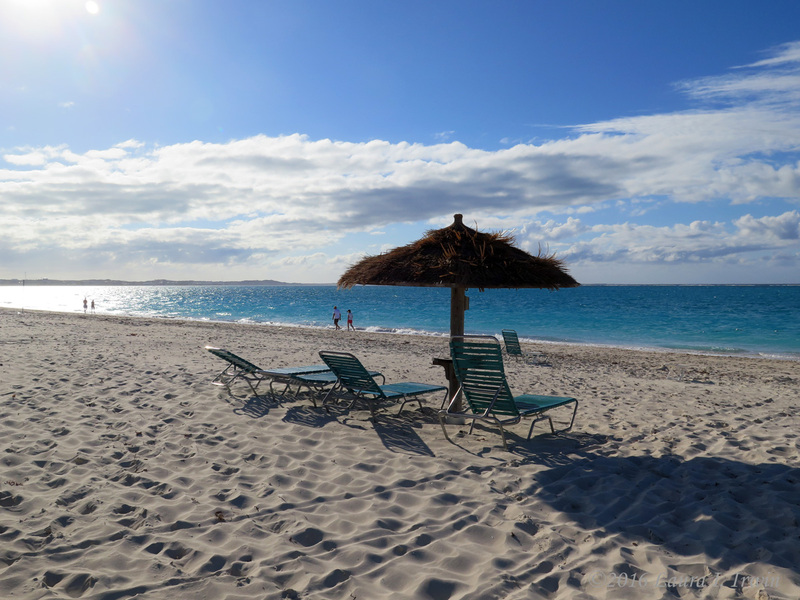 Providenciales is mainly a flat, scrubby island, but the beaches more than make up for the dull inland landscape. 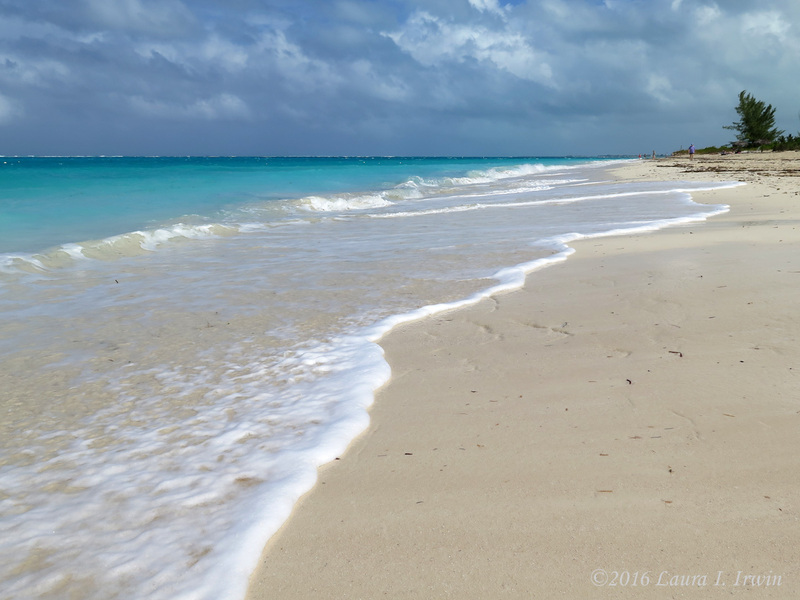 This afternoon, I decided to head to two of the quieter beaches on the south side of the island – Sapodilla Bay and Taylor Bay. On my way, I made a quick turn down the aptly-named Picturesque Lane to see Chalk Sound. The water is a milky blue/green color and absolutely stunning. 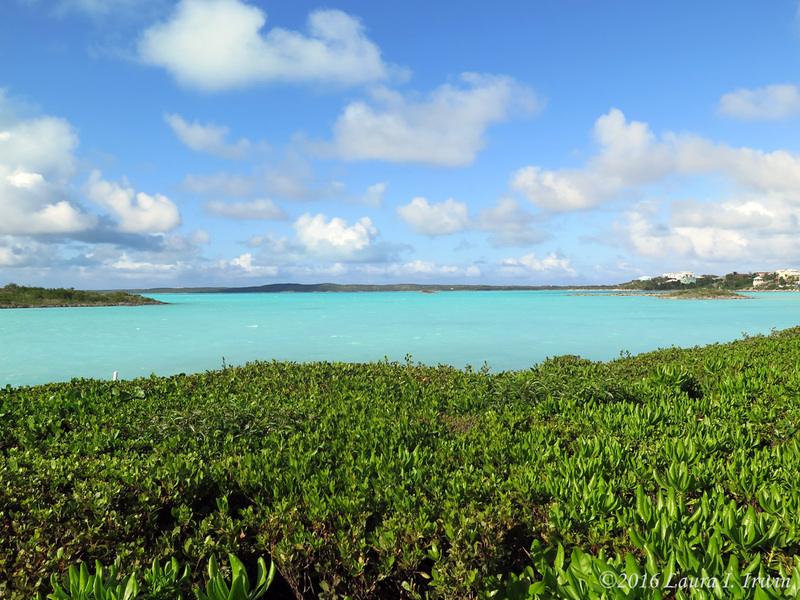 I spent a morning at Taylor Bay two years ago, and I stopped by Sapodilla Bay last year, so I knew the water would be crystal clear for hundreds of yards out. This time, I climbed Sapodilla Hill before heading to the beach. The hill has many old inscriptions left by sailors on the rocks, some dating back to the 1700s. 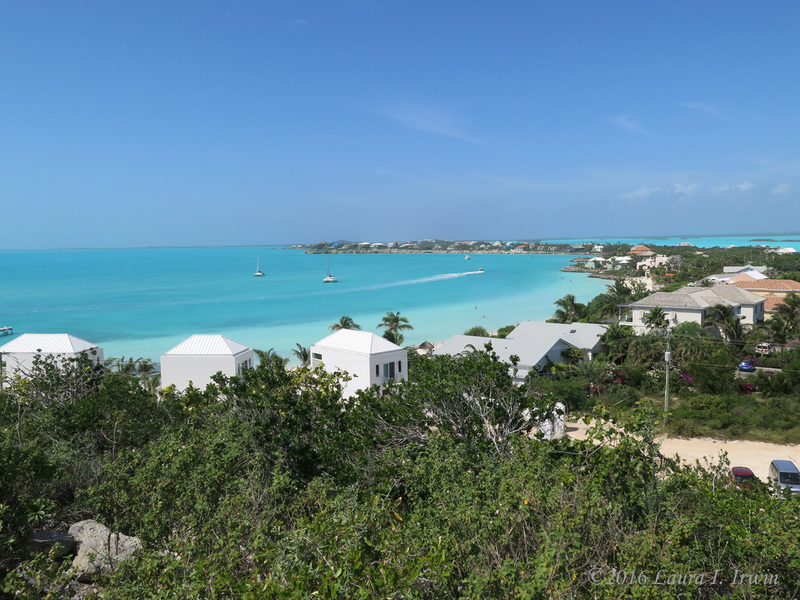 From the top of the hill, you have a bird’s eye view of Sapodilla Bay and Chalk Sound. The beach at Sapodilla bay is very narrow and had a lot of visitors today, so I walked the length of the beach and then headed over to Taylor Bay to swim. Tonight was the Manager’s reception at The Sands. All the crackers and cheese, veggies, chips and salsa, and conch fritters you can eat… plus bottomless rum punch and/or Turks’s Head beer! I settled in on a chair by the pool and starting chatting with the woman next to me. She was a retired middle school German teacher from New Jersey, also traveling by herself, and we spent the better part of an hour talking about teaching and travel. 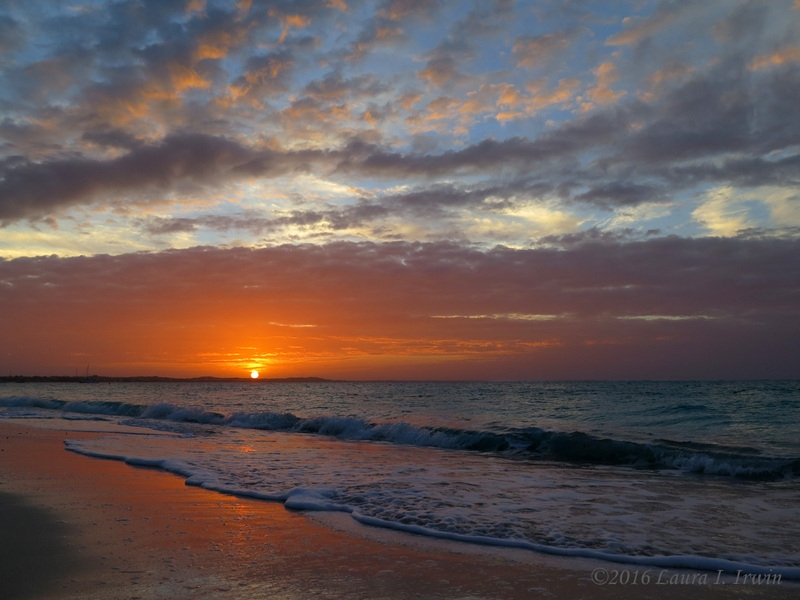 The perfect ending to the evening was another gorgeous sunset over Grace Bay! Paradise isn’t quite as paradise-y when it’s windy and rainy. Fortunately, while the wind was persistent all day, the rain was mostly showers off and on breaking up the “monotony” of the sunshine. But before we jump into today, let’s recap last night. My room was 76 degrees when I got here yesterday afternoon, and hadn’t cooled down at all when I got back from dinner. They sent over someone from maintenance who spent literally an hour doing something with the water tank in the bathroom. He assured me I was all set and the room would cool down. It didn’t. Instead, I spent the night tossing and turning in 76 degree heat. Now, when it is cold at home, I love to be toasty warm. I keep my heat set at 72 degrees all winter. But when it’s hot out, I am a big believer of turning on the a/c and piling on the blankets. Needless to say, sleep was a bit elusive last night. Nevertheless, I jumped out of bed at 7 this morning, got ready, and ironed all my clothes for the week. I’m kind of obsessive about non-wrinkled clothing. Then I went for a short walk on the beach before heading to Shay Cafe for breakfast. I had read great reviews and was eager to try it for myself. I opted for the strawberry crepes, which sound a lot better than they were. As I saw other people’s egg sandwiches coming out, I was envious. I should have gone healthy. After breakfast, it was back to put on the sunscreen and hit the beach/pool. The weather kept me busy moving inside and out all day (luckily, an A/C tech was able to get the room cooled down this morning). We’d have an hour of sun, followed by 15 minutes of showers, followed by a half hour of sun before another shower set in. The wind was whipping all day and the waves were crashing. I’m not a big salt water person, so I much prefer the chlorinated water of the pool anyway. I managed to finish my first book of vacation this morning and start my second. I love being able to read for hours at a time! Dinner tonight was at The Caravel. The Caravel is fairly new, and is well deserving of all of its great reviews! The fish tacos were served in little pillow-shaped taco shells with a trio of dipping sauces – sour cream, a spicy ranch, and an even spicier salsa. 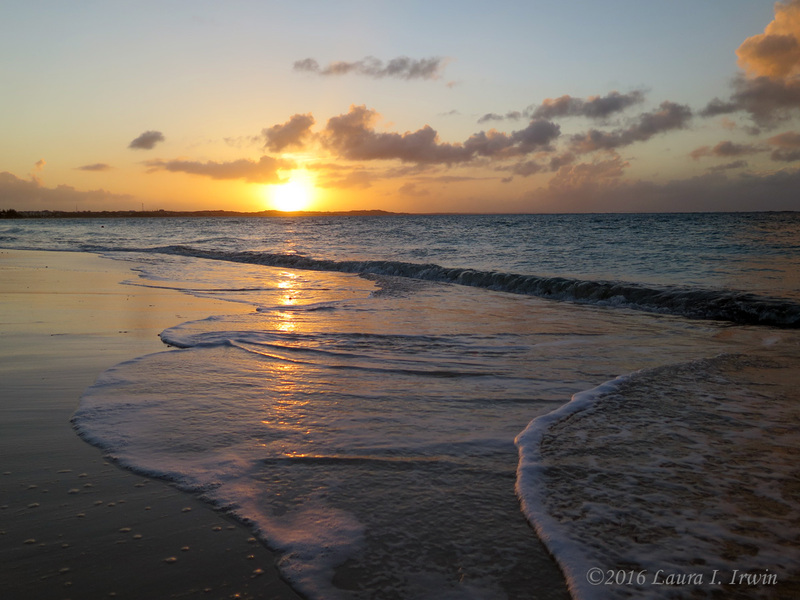 A sunset walk on the beach was the perfect ending to the day! Paradise. That’s the only word that comes to mind to describe Turks and Caicos. Warm weather, sun, and sand. Exactly what this trip is all about. This is my third visit to TCI, and a week of relaxation, sun, and reading is just what I need. 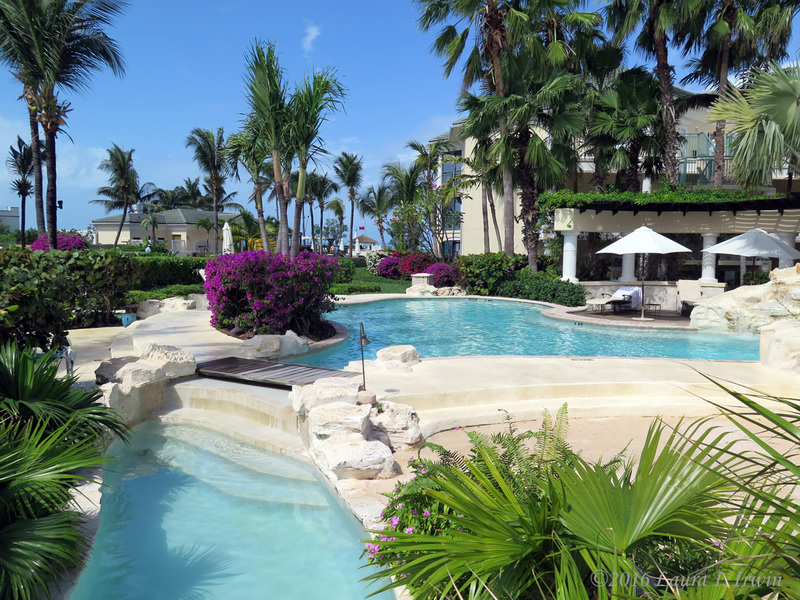 I have thought about visiting other islands (Grand Cayman was a top contender for this trip), but in the end, I love Grace Bay Beach (the main “resort” beach in Providenciales) and the familiarity of visiting a place I love. But let’s rewind about 16 hours. My day started at 3AM. Yes, you read that right. After booking my flight back in September, American Airlines (in their infinite wisdom) decided to change my flights, leaving me with just a 45 minute connection between two terminals in Philadelphia. Thankfully, when I called them last week, I was able to switch to an earlier flight out of Boston, leaving at 5:30AM. So, all is well, right? As it turns out, we taxied out to the runway, only to return to the gate 15 minutes later due to a computer glitch. Fast forward an hour, and we finally took off at 7AM. The EXACT TIME my original flight was scheduled to leave. So, now all is well, right? Not so fast. 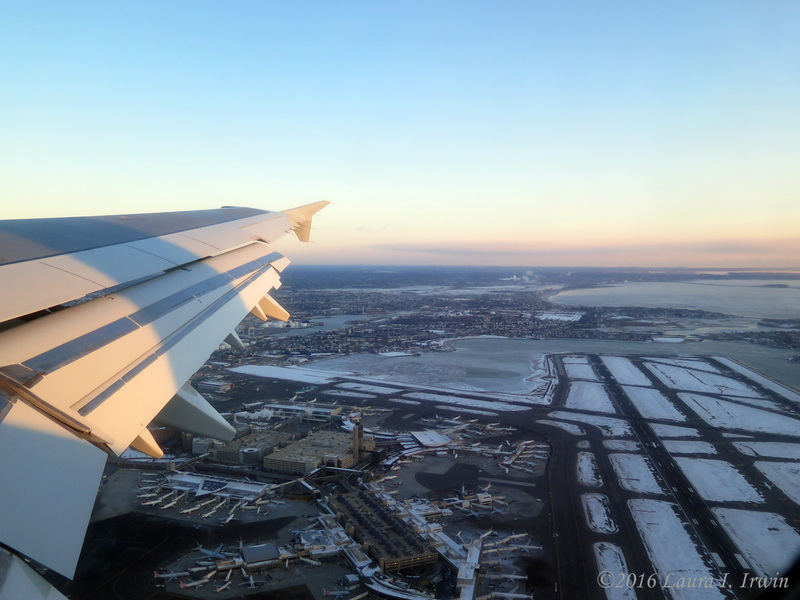 Board the flight in Philly, taxi to the runway, and… return to the gate. Again. This time for some mechanical paperwork that wasn’t done. 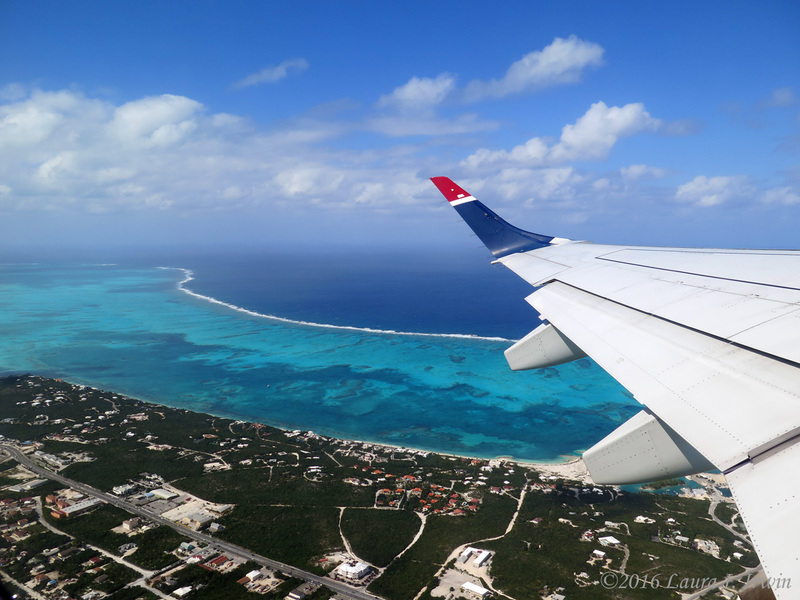 Fast forward another hour and 15 minutes, and I was finally on my way to Providenciales. Where I picked the slowest immigration line. I started with about 100 people in line behind me and by the time I got through there were maybe 10 people left. Off to pick up the rental car (I had a surprisingly easy time adjusting to driving on the left this time), and by 4:15 I was happily in my room at The Sands drinking rum punch and Skyping with my family in Florida. 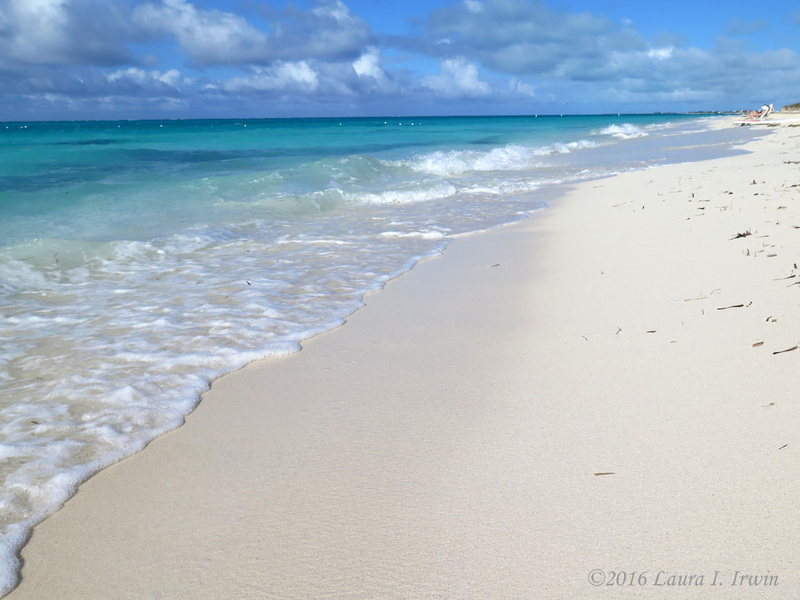 I quickly dipped my toes in Grace Bay before heading out to the Flamingo Cafe for dinner. I was really looking forward to a frozen drink, but alas, they had very limited flavors, and I was “forced” to make do with a rum and coke to accompany my jerk chicken wrap. I hadn’t been to Flamingo Cafe on my previous trips, but I always read good things about it. 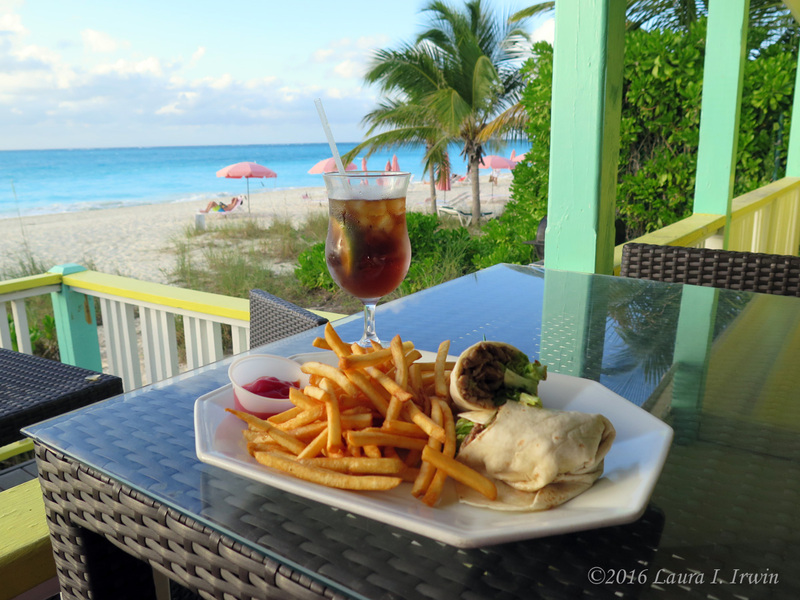 The setting was perfect – right on the water with views up and down Grace Bay Beach. Were it not for a line of clouds on the horizon tonight, it would have been a perfect sunset. After dinner, I stopped at the Graceway Gourmet IGA to pick up a few snacks to have on hand in my room. Prices here are at least double what you pay at home. I plan to eat out for most meals, but I do like a few snacks on hand for the mid-day and late-night munchies! I’m pretty sure I’ll be calling it a night very soon. 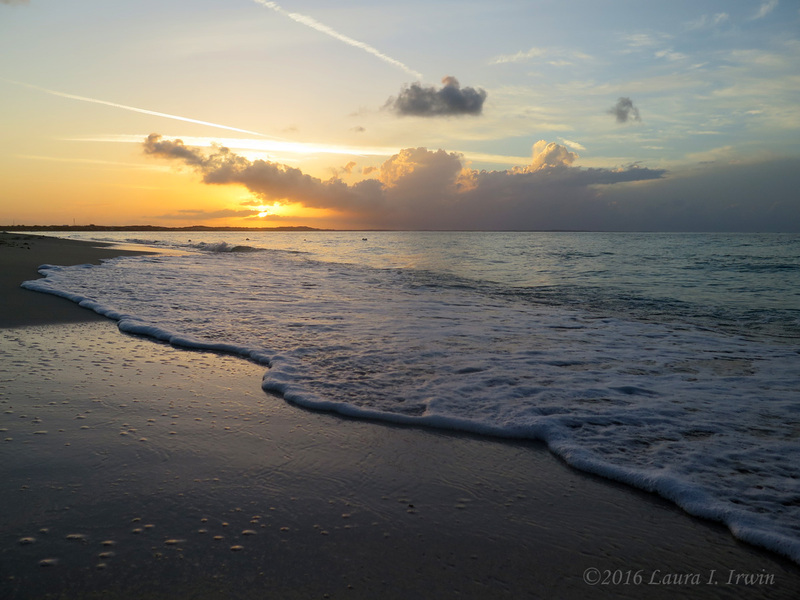 Turks and Caicos recently decided to observe Daylight Savings Time permanently, meaning they are on Atlantic Standard Time year-round. My body only thinks it is 7PM, but after a full day of traveling, I’m ready for some much-needed sleep!